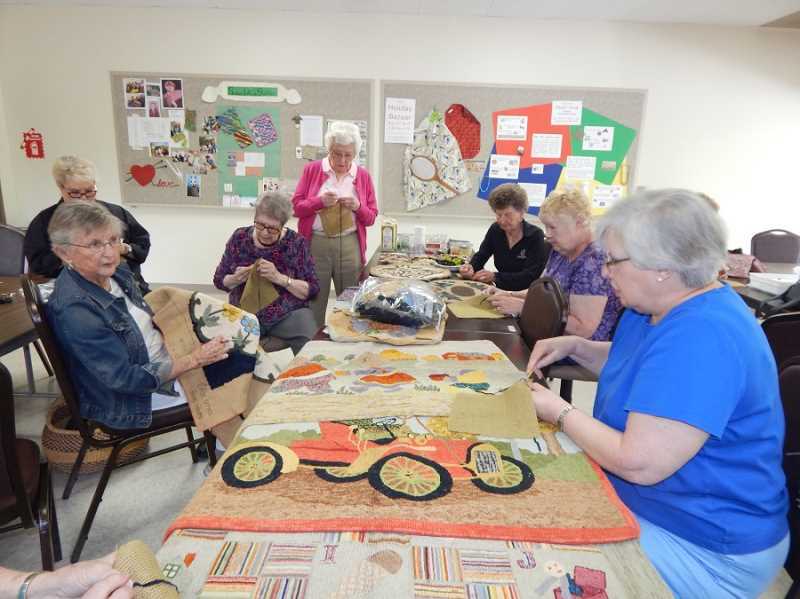 After the jokes about hookers were over, members of the Summerfield Craft Club got down to the business at hand at their June 27 meeting to learn the ancient art of rug hooking from Mea Alford. But first Alford provided a history of rug hooking, explaining that while there is no record of when it started, it has been around for at least hundreds of years. "Rug hooking started in this country when they needed something for the floors of their cabins," Alford said. "Hooked and braided rag rugs were the first form of recycling. The pioneers rarely bought new things, and they tore up old, threadbare clothes for rugs." Once the history lesson was over, Alford and Sharon Hughes handed out squares of burlap and crochet hooks and offered a choice of yarn colors for the women to try their hand at rug hooking, with Alford explaining that some people use plastic mesh for the backing but burlap also works well. "Women would cut up burlap sacks and cut up old dresses when they got worn and old, or they would go into thrift stores and buy clothes to cut into big pieces," Alford said. "They would bleach the fabric if it was not the right color, followed by dying the pieces the color they wanted. At the beginning of the 20th century, rug hooking became a popular craft." Alford held up an unfinished hooked piece featuring yellow and blue flowers, saying, "My grandmother said to draw the design you wanted to hook, and I did. I got the flowers done but doing all the background is beyond torture." She added, "My daughter's mother-in-law and the mother-in-law's twin sister were big into rug hooking. They made gorgeous rugs and wall hangings. They went to the beach every year for three days to learn more. They were wonderful hookers." The room grew silent as the women bent over the pieces of burlap and tried their hand at rug hooking, with Alford saying, "I love it. This is the most energetic I've seen this group." And one woman broke the silence by saying, "I think I've got the hang of it." 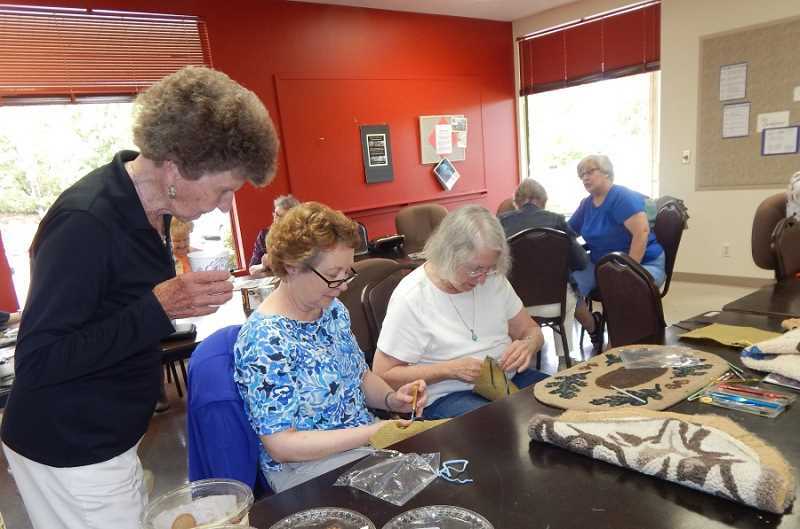 Hughes reminded everyone that the clock was ticking on this year's holiday bazaar, set for Nov. 3 and 4 from 9 a.m. to 4 p.m. at the Clubhouse, and she reminded members to be working on items to sell to benefit the Tigard Senior Center's Loaves & Fishes program.